Spinzwin Casino is an all new ProgressPlay powered casino, which has arrived fully operational and ready to give any mobile gamblers a great new place for them to settle down and enjoy some excellent casino games and rewarding promotions. As with every casino which is built on proprietary software, it has to try it's best to stand out from the crowd and deliver its players an experience that they won't forget, something which Spinzwin clearly pulls off from the moment you load up its front page. Spinzwin Casino emulates all the best parts of a ProgressPlay powered casino. Right out of the box, Spinzwin can already provide its players with over a dozen weekly promotions and hundreds of slots, table games and live casino games. Spinzwin also arrives perfectly optimised for mobile, desktop and tablet players, so no matter how you play your casino games, Spinzwin Casino is available to you. That is just the general overview of why Spinzwin is a solid casino for players to check out, but if you continue reading our review, we'll break Spinzwin down into its finer points. Spinzwin Casino provides a games library which a majority of casino fans will be mostly pleased with. Slots are usually the most important part of a casino to nail down and Spinzwin does a good job by hosting games from slot developers like NetEnt, Microgaming, NextGen and Elk Studios. 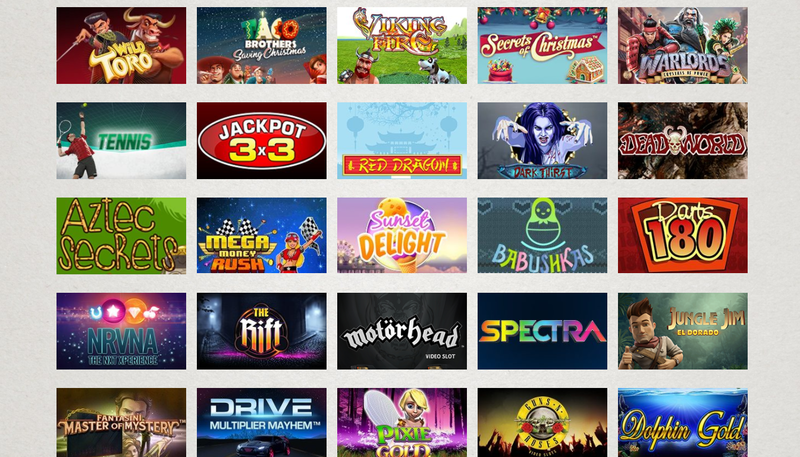 Each of these big name developers has their entire library of games available at Spinzwin and any new slots released by them are available to play from day one. Spinzwin has only been open for a week or so and yet already has hundreds of slot games, with that number expected to rapidly expand, so players won't feel shortchanged. Alternative gaming types are also available and while Spinzwin isn't pushing any boundaries, it's done more than enough to satisfy the players that it needs to. There are progressive jackpot slots to play, a substantial library of casino table games, with numerous variants of each key game and finally a live casino selection. Both the standard and live casino games have all the major gaming types which includes: blackjack, roulette and baccarat. However, on top of that, there's also multiple variants of each game such as multi wheel roulette, roulette master, multi hand blackjack and blackjack pro. The welcome bonus at Spinzwin is short and sweet. It is multi layered, with more rewards being dished out the more a player deposits as their first payment, with the intent being that the welcome bonus can appeal to a wide range of bankrolls, without making any player feel shortchanged. There's a single deposit match here, with a 100% deposit match up to £200. You can deposit from as little as £10 in order to enjoy that deposit match. There's also a further 25 extra spins available for Aloha Cluster Pays, but players will need to deposit the entire £200 maximum deposit in order to receive these. If there was one significant complaint to be said of Spinzwin, which could also be levied at every ProgressPlay casino, it would be that the wagering requirement of 50x is on the higher end, so players who want to wager their bonus cash quick should beware. To compensate for this, Spinzwin have allowed players 90 days to fulfill any wagering requirements, which is almost triple what most casinos would offer, but wagering requirements are still on the high side all the same. The defining achievement of Spinzwin Casino, and the factor which is most likely to win players over to signing up with it, is its sheer number of promotions. Spinzwin has over a dozen promotions active on it, which can be played throughout the week. These promotions generally include a happy hour, game of the day, weekly surprises and live dealer weekends. There's also special one off tournaments and competitions with real world prizes and holidays up for grabs if players play on certain games. As before, each of these promotions come with that same 90 day period to complete any wagering requirements, which makes completing the bonus terms and conditions feel a lot less stressful than it does at other casinos. All in all, Spinzwin doesn't innovate in any way, but it does make sure that players have something to play for every time they log in, which is more than enough to keep most players engaged and happy with Spinzwin. No one is going to have a hard time depositing or withdrawing at Spinzwin during their time here. Spinzwin accepts deposits from pretty much every single major banking method, which includes: credit card, debit cards, Neteller, Skrill, Trustly, Paysafecard, bank transfer, instaDebit, iDEAL, Giropay, Euteller, QIWI, WebMoney and even Pay By Phone. All in all, players can deposit using online banking, mobile banking, e-wallets, vouchers and even mobile phone bill depositing. Deposits can be made from a minimum of £10 and withdrawal limits stand at £3,000 per week and £6,000 per month, which although a little tight, shouldn't pose a problem for your average player. Withdrawal times are slightly sporadic, with Spinzwin nailing the speeds in some areas and having really unspecific withdrawal times for other banking methods. Spinzwin promises a 24 hour payout time for any e-wallets, which is absurdly fast, but claims card payments can take between 3 – 6 days. If cards only take 3 days then that's impressive as well, but the fact that it can stretch out to 6 days is much higher than any other casino promises, so you're taking a bit of gamble when it comes to your payout speeds with any other method other than e-wallets. Players can contact Spinzwin Casino at any time of the day, since Spinzwin provides both a live chat and on site email contact form, which are both active 24/7. If you want immediate help, then you can start a live chat and have a customer support adviser helping you out within minutes at any time of the day. However, for non-emergency requests, players can use the on site contact email form and receive a response within a few short hours. Want to play at Spinzwin Casino? Spinzwin Casino has all the games and promotions that any player will need to have a great time! Earn £200 & 25 Extra Spins Now! Spinzwin Casino Spinzwin Casino is the perfect casino for any one who wants a no nonsense casino experience. If you want to play on a range of devices, enjoy a substantial library of games and get promos around the clock, then Spinzwin is perfect for you. However, if you want ultra niche titles and something more original, then you're going to be sorely disappointed with Spinzwin. Spinzwin has gone down the route of satisfying the largest number of players and in that goal, it has come out on top, so outliers need not apply. Slot Fruity Mobile Casino Review – £5 No Deposit Bonus! Cashino Casino Review — Enjoy Lots Of Cash Prizes And Games!